I love turning scraps into decor items... paper, for example. "OK, what can I do with THIS? (besides pitch it into the recycle bin)." How about a tutorial, you say? OK! 1. fold sheet of paper (music, construction, magazine page) in thirds as shown. 2. fold in half where the two sides meet in the center. 3. draw half a flower shape with four, five, or six pointed leaves at the double -folded edge of the paper. 4. cut the flower shape out - this will create TWO flowers because of the double fold. 5. cut a strip of another kind / color of paper - @ 1" wide and 4" long. 6. fold 1/3 of the strip toward the center, lengthwise. 7. unfold the folded third of the strip, and cut slits into it (creating a thick 'fringe'). 8. roll the strip over on itself @ the size of your finger, and glue the rolled portion to the flat portion. 9. continue rolling and glue the end of the strip to the roll to secure it. 10. fold the fringed ends together and glue into place. 12. place the rolled section in the center of the cut-out flower shape, with the glue down. Now you have a daffodil! You can glue this to a magnet or card, or shadowbox frame. cut a circle about the size of a quarter. 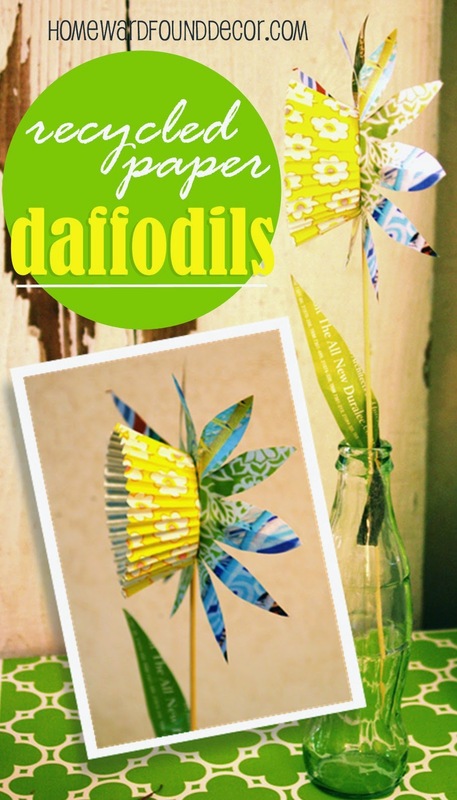 15. secure the back of the daffodil to a bamboo skewer, using a small piece of masking tape. 16. glue the circle you cut out OVER the masking tape, using the glue stick. 17. cut a leaf-shaped strip from the leftover paper scraps. 18. push the bamboo skewer 'stem' through the paper leaf. 19. put glue on the leaf and wrap it around the bamboo skewer once. like a real daffodil leaf. 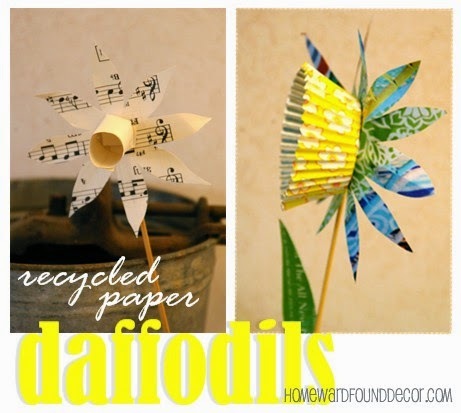 display and enjoy your paper daffodils! use a cupcake or bonbon paper liner instead of rolled paper for the flower's center! results in bright, happy flowers!